If you live in a smaller home, you know that Christmas trees take up a lot of valuable space during the holidays. Space that you may not have to spare. Right? So why not try this fun and fringy DIY alternative Christmas tree idea, that towers over 6 feet tall, but takes up virtually no space at all. Oh, and by the way, it also makes the perfect holiday photo backdrop. Pretty cool, huh? Here's how to make your own giant wall art Christmas tree at home. Lay out four of the five pieces of white foam core vertically, two up and two down, to form a larger rectangle. Place fifth piece of foam core at the top of the newly-formed rectangle, horizontally. Make sure that top piece is centered. Using duct tape, attach all the pieces together to form one giant piece. I added a few layers of duct tape on both sides, along the creases. NOTE: I am using black tape in the photos so you can see where I've added duct tape. Your duct tape will be white to blend in with the white boards. Map out the size and shape of your tree with painter's tape or masking tape. Make sure your tape is secure to you boards before moving on to step three. Your tape lines will now serve as a straightedge. You can use a yard stick instead if you'd like, but the tape actually works really well on it's own. Using your Xacto knife, carefully cut your Christmas tree shape. 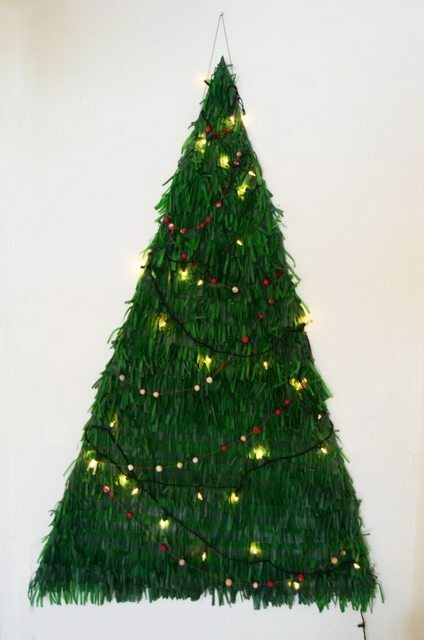 Once your Christmas tree is cut, you are ready to start creating the tree fringe with tissue paper. Cut a full sheet of tissue paper in half (hamburger NOT hot dog). Take one of your half sheets and fold it into thirds, still the hamburger way, so you create a really long rectangle with three layers. Now it's time to let the fringe begin. Using your fringe scissors, cut fringe, leaving about one inch of room at the top. You will be making a lot of these sheets, so you might want to grab a drink, and a comfy seat. Starting at the very bottom of your tree and working your way up, you can now start gluing your fringe. Flip your fringe over, add a bead of glue across the length of the top (where you left that extra inch of non-fringe). And attach to the bottom of your tree. You'll want the very bottom layer to hang off the end of the board so that it can cover your tree trunk, which you'll add later. Depending on how large your make your tree, you will most likely need two fringe strips for each line toward the bottom of the tree. Start your next layer (the second line of fringe) a little higher than the one below it. You want to cover the non-fringey area from below, but just barely. Continue this process until you've covered your tree all the way to the top. Once dry, flip your tree over so the back is facing toward the sky. Glue any overhang to the back. This is also a good time to attach a picture frame hook as well, so it is ready for hanging. To create the tree trunk, cut a scrap piece of foam core into a stubby rectangle that is roughly one fourth the length of the bottom of your tree. Cover in brown craft paper and then cut small fringe strips, just like you did with the tissue paper, with recycled grocery bags. Secure fringe to trunk with glue. Attach trunk to tree with duct tape on both sides (front and back), which will be covered by your tree fringe in the front. Now you are ready to hang your tree, add some garland, and enjoy. Now that my tree is hanging, I think it is feeling a little lonely. It may be time to invite over some friends for a photo op. I really want to use this as a photo backdrop for our Christmas pizza party. How to Store: Since the boards are pieced together with duct tape, it would be easy to score the tape in the back with an Xacto and fold it into sections when you are ready to pack it away. Store in an air tight container (the long skinny ones that can be stored under your bed would be perfect if you are folding the tree up to store it). When you are ready to use it again, just re-tape the back and fluff up the fringe. If any areas of the tissue are damaged, you can easily replace the damaged strips next year. Just keep a couple extra pieces of tissue paper around in the color you used. What do you think? 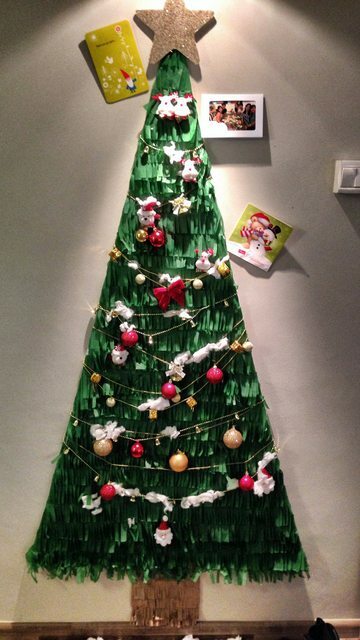 Would this alternative Christmas tree idea work in your home? Oh, and don't forget to check out my garland how-to right here. It only takes five minutes to make. So easy! Check out our whole collection of Premium Content right here! I really like this, but I am wondering if there would be a way for me to hang some of my kids personal ornaments?? Awesome idea for small apartments like mine! :) Added a small spotlight (from Ikea) above my tree - makes a world of a difference! Oh I loved this idea! Thanks for sharing. It turned out even better than I hoped. I also stole the books for a trunk idea. I ended up addding lights to brighten up the corner it was in. I tried this out too, and it turned out super cute! Also, I found the paper in the party/gift wrap section at AC Moore, but they only had a darker green, just in case anyone else is looking. thanks for this great idea of the x-mas tree. here how mine look like. It looks so good Magdalena! Thanks for sharing the link. I love that you added Christmas tree lights to it. Makes it even more festive! Great job. Thanks for this tutorial! I've just fininshed making my own tree, you can see it here if you want. This is so cute! Would be great for those creative types who live in small spaces or may be even at schools and let the children help make it. Hey Britney. I got the tissue paper at hobby lobby and the tissue color would best be described as mint colored. Good luck! Love this! Where did you get the tissue paper, and what is that color called? Very cool, I love it! So using this for our christmas photo backdrop and party. I love the idea of it. To me, its saying, tropical christmas party! This is so pretty! What a fun idea for a backdrop too.